Instantly turn your WordPress blog into a professional job listing Web site. Give employment recruiters the extra access they must have with the recruiter role. Enabling the recruiters option in JobRoller adds the role to the registration page unlocking extra permissions for the power users that need it. It’s Simple, Anyone Can Do It! Company image logos uploaded with each job listing are automatically re-sized into three different sizes. All images are accessible from within the WordPress media library and are visible on the job listing edit screen which makes management a breeze. Each job listing includes a built-in “Apply for this Job” form so applicants can instantly upload their cover letter & resume. Their application gets routed directly to the job poster via email. JobRoller includes the latest technologies with features like AJAX field auto-complete and jQuery Lazy Load which helps your site load faster and saves you precious bandwidth costs. The AppThemes Marketplace has the plugins you need to supercharge JobRoller and take it to the next level. 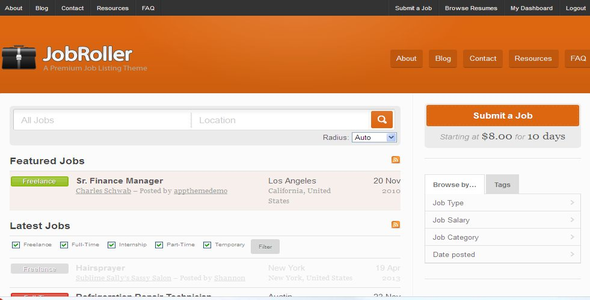 Get job feeds, payment gateways and more. Or get a whole new look with an attractive child theme. Get jobs from the biggest names in the biz! Indeed, Simply Hired, Careerjet and LinkedIn want you to post their jobs on your site and they’ll pay you to do it. Our publisher feed plugins make it happen. Indeed comes with JobRoller at no extra cost. Share the post "JobRoller themes"